Recently, the new meditation group "Samaya" has been established in Vienna. It follows the Drikung Kagyu tradition. The group is lead by Drubpon Tsering Rinpoche, a longstanding student of the renown Drikung Kagyu master Garchen Rinpoche. Lama Tsering therefore recently paid a short visit to Vienna. It was the second time he came to town, but the first visit to the new group. During the short program (Thursday 3rd – Sunday 6th of April, 2014), he offered instructions and an empowerment. Unfortunately, I was only able to attend the first day of the program, the public teaching on Thursday evening. About 30 to 40 people had gathered for this event in the spacious meditation hall. During the public Dharma lecture, Rinpoche talked about "Love and Compassion in our day-to-day life". He explained that the importance of these qualities should be obvious already from the fact that they play a central role in almost all religious systems. He further explained that a mind which is filled with love and compassion for others is naturally peaceful, loving and joyful since it is unperturbed by mental afflictions. Loving kindness and compassion can be developed through meditation. By habituating oneself with these qualities, we will eventually gain the superior intention of benefiting others, and develop bodhicitta, the awakening mind. As a result, all one’s actions will be motivated by loving kindness and compassion. Thus, training in these qualities leads to benefit for both oneself and others. Lama Tsering Rinpoche also stressed the importance of developing loving kindness and compassion for our modern societies. A lot of development has taken place in terms of technologies and material growth. If such development is not complemented by inner growth as well, it bears the risk that technology may be misused. If for example used as weapon, it can cause a lot of harm to sentient beings. It is therefore essential that people work on developing the inner qualities of loving kindness and compassion. Consequently, he therefore also taught some simple meditation methods for cultivating these qualities. On the basis of selected verses from the Thirty-Seven Practices of a Bodhisattva by Ngulchu Thogme Sangpo, he then also gave further advices for implementing loving kindness and compassion in our daily lives. On the week-end, the course continued with an empowerment in White Tara, and instructions for its related practice. It was reported to me that those in attendance were inspired very much by Rinpoche's calm and loving, but nevertheless powerful presence. From now on, the new Viennese meditation group Samaya will meet regularly for the practice of White Tara: Each Monday, 7 p.m. – 9 p.m., at Seminarzentrum zeiTraum (1070 Vienna, Bandgasse 34/29c, 2nd courtyard , first floor). A further weekend course with Drubpon Tsering Rinpoche in Vienna is set to take place in June (Saturday 7th - Sunday 8th of June, 2014). The subject of this course will be Sangye Menla (Medicine Buddha) and the associated meditation practice. Check out the following website for further details: www.samaya.at. 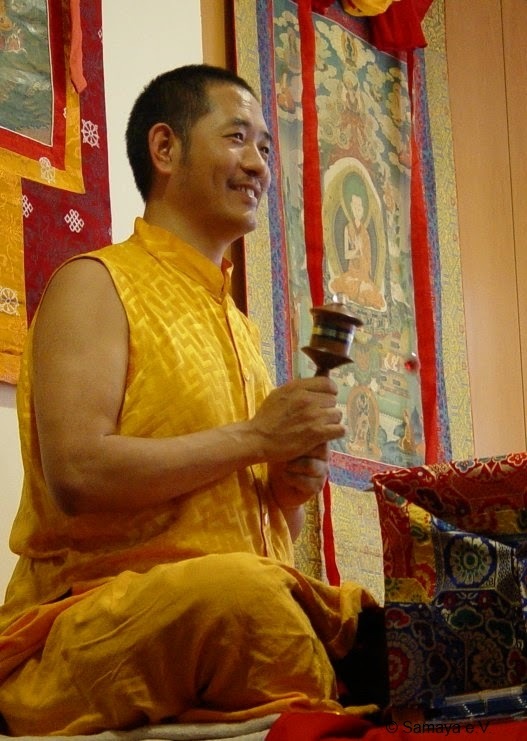 Since 2002, Drubpon Konchok Tsering Rinpoche is the resident teacher of the Drikung Garchen Institute in Munich. He received a comprehensive traditional Buddhist education in the Drikung Kagyu tradition and has been awarded the title of a Drubpon (Retreat Master) by H.H. Chetsang Rinpoche und H.E. Garchen Rinpoche. He frequently visits and teaches at several Drikung Kagyu Dharma centers throughout Europe. Fotos: © Buddhism and More (1), and Samaya e.V (2).